A roof is the condo equivalent of a Swiss Army Knife; a multi-function device essential to a quality lifestyle. The condo roof keeps water out, helps maintain air quality and comfortable temperatures, and offers common area space and amenities. It is a necessary and important part of external building maintenance. Keeping the roof in good working order requires periodic inspections, or reviews, and ongoing preventative maintenance. Condominium managers should inspect and conduct preventative maintenance on their roofs at least twice a year. A fall review can ensure the roof is ready for a potentially harsh winter. Spring is the time to identify any damage that occurred during winter months. During a visual review anything out of the ordinary should be noted for follow up by a qualified professional. Any previous roof review can serve as a point of reference to identify what has changed. Visual inspections should include pictures of any anomalies noted as a potential problem requiring remediation or repair. 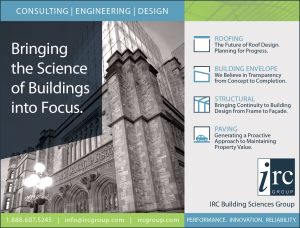 IRC Building Sciences Group specializes in roofing assessments and remediation solutions. Zen Szewczyk, Executive Director, and his “Team of Roofing Specialists” advise on how to keep your condo roof functioning at peak efficiency, and how to extend the serviceable life of one of your most important assets. Avoid reviewing roofs during high wind events. Keep your eyes on where you are going and never walk backwards on a roof. Take necessary precautions when near skylights. Stay at least two metres away from any roof edges. Areas of ponding water or stains indicating prior ponding – standing water can cause premature deterioration of the roof membrane. Roof areas that feels spongy – possible sign of moisture infiltration in the insulation components of the roof system. Skylight and vent areas – which can be prone to penetrations – with signs of damage, staining or leaking. Sealant around the roof projections and perimeter details that are deteriorated, no longer flexible or not fully attached. Flashings – metal protection for the roof membrane – that appear rusted or damaged. Spongy bubbles, ridges or cracks on the top of flat roofs which may indicate deterioration and moisture intrusion. Remove any debris that may damage or puncture the roof membrane – branches, furniture or similar items; glass. City regulations require PVC membranes be washed annually to qualify for Toronto’s “Cool Roof” incentive program. 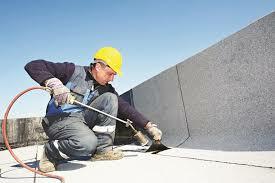 Roof anchors must be inspected each year by a professional engineer. Load tests are required at least once every five years. Condominium corporations can obtain a ‘Roof Condition Assessment’ by a qualified roof consultant to determine the current condition of their roofs and associated components. This aids in developing a plan for preventative maintenance and planning for any future remediation or replacement.